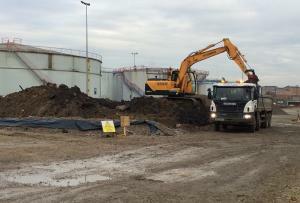 This project involved major infrastructure improvements being undertaken on a live petrochemical facility adjacent to the River Thames on behalf of a multi-international company whereby asbestos contaminated soil (ACS) was excavated and either re-used or exported. Whilst VertaseFLI would normally carry out design and subsequent delivery of remediation works, on this occasion we acted solely in a consultancy and supervisory capacity to ensure compliance with the Control of Asbestos Regulations 2012 (CAR 2012). Following appropriate site investigations, made ground at the site was found to be contaminated with Chrysotile, Amosite and Crocidolite forms of asbestos at high concentrations. In addition to the asbestos, significant TPH contamination was also present including free product. VertaseFLI was employed to assess the proposed works in the context of the asbestos contamination to ensure works were undertaken in accordance with the CAR 2012 and ACoP L143. 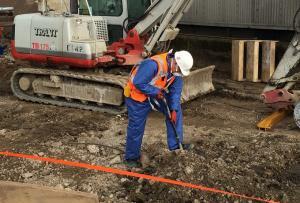 On assessment of the site investigation data which included comprehensive testing and quantification of asbestos contamination, it was deemed necessary to complete a formal asbestos risk assessment in accordance with Regulation 6 and subsequently also completed a detailed plan of work in accordance with Regulation 7. In order that the client and their employees complied with the Plan of Work and the wider requirements of CAR 2012, we also provided comprehensive training for work with asbestos and use of appropriate PPE and RPE. To ensure the works were in line with the risk assessment and that the controls contained within the plan of work remained compliant, we also undertook comprehensive personnel and ambient asbestos re-assurance monitoring through the provision of a full time on site asbestos analyst. We provided full supervision of the works which following subsequent review, was able to be reduced to a visiting capacity. In addition, we undertook appropriate classification of the ACS in order to determine which soils were suitable for reuse under a Materials Management Plan and for classifying those soils not deemed suitable as either hazardous or non-hazardous. Thereafter, VertaseFLI undertook disposal of all ACS and asbestos wastes to appropriate disposal facilities.